The day opened and closed like a camera lens. The sun marked its movement in fiery steps. Despite the sun cream and the hats, I could see Domi, Emma and Taylan reddening before my eyes. It was hot. Far too hot for building. ​By evening most of the group had assembled. Tents popped up all over the garden. By chance or design each was a different colour creating a rainbow hobbit’s-ville of canvas. Just three participants were missing; one young woman was coming the next day. But we were still expecting two Turkish guys from a seaside town up the road. “No no we found one. Someone gave us one!” said the taller of the two men. This was Kemal. He was foreboding in height and expression. He lumbered up the terrace steps slowly. Bear-like. And flopped onto the hammock tied between the terrace supports. Taylan: Animal and Youtube lover. Works in a bank but for how much longer? Emma: Yogi and healthy lifestyle guru. Can also use a spade. Domi: Blogs on his life in Van. Also a dab hand with barbed wire. A big thank you to all those supporting this site on Patreon. 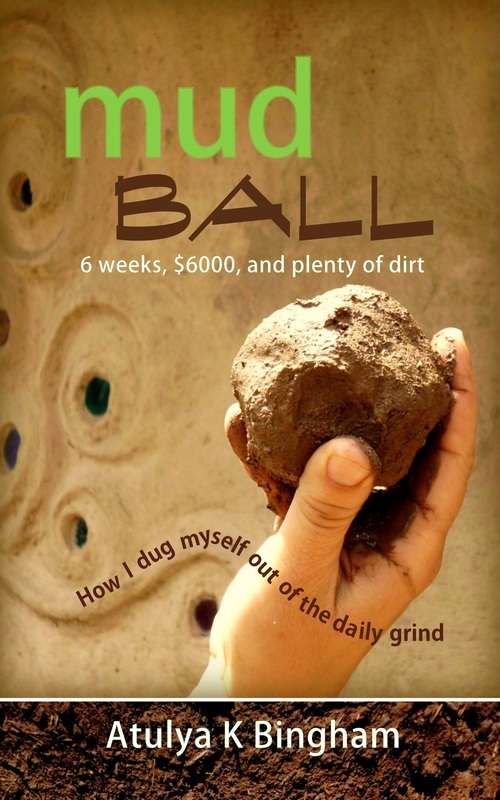 Mud Ball is available in ebook and paperback. Step by step, how I built my earthbag house. 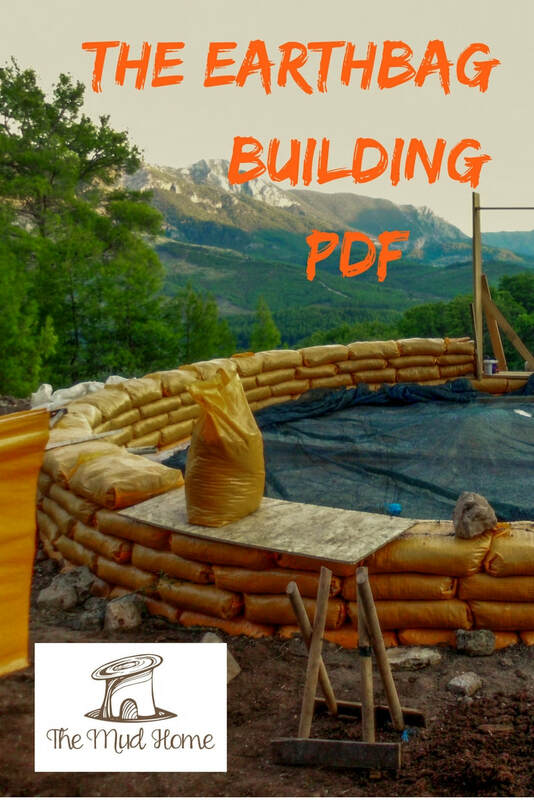 Pick up your free earthbag PDF. No alcohol is allowed during the workshop, though you may have a civilised glass of wine with your evening meal. This was the wording in the workshop advert, and I think it was pretty clear. Earthbag is an extreme sport and the last thing I needed was drunkards entangling themselves in the barbed wire or tripping off the earthbag walls. Besides, I wanted to attract serious and dedicated earthbaggers, didn’t I? The frayed ends of day one had been knotted neatly together. We had left the site for dinner in the valley. The night sky slid through the mesh of the pine forests like warm carob molasses. Sweet. Sticky. Though we, after a day of trench digging, were stickier. After dinner, I trotted about the guest house garden, gathering my flock. It was time to drive everyone back to the site to sleep. We had an early start. So imagine my surprise, as I picked my way through the plexus of orange trees, on finding a scrum of earthbaggers roistering about a bottle-littered table. They were knocking back beer with a vigour and volume one usually associates with Friday night on any given high street in the UK. Folding my arms, I surveyed the jeering, japing group searching for an instigator. My gaze fell upon a long-haired, bearded chap with a grin. Any ordinary day, one would never believe that Gautam could be the catalyst for such mischief. He and his partner Kim had flown in from India and were commonly agreed to be the sweetest couple in the history of earthbagging romance. Further more, neither of them had slept for days. “Oh it was terrible. I really didn’t think we would be able to make it. There were floods and storms everywhere in Mumbai.” Gautam had scooped heaps of air up into his arms on arrival day to illustrate a storm hitting an airport. He sported two dark ellipses around his eyes issue from jet lag and fatigue. “Yes, it was very frightening,” Kim shuddered. She was pretty and petite. “But don’t worry we’ve come here to work. We will work very hard,” she said and wiggled her head earnestly. They had indeed worked hard. If a spade needed fetching, Gautam ran for it. If a rock needed moving, Kim slid her work gloves on and moved it. Certainly Gautam and Kim were the epitome of politeness and helpfulness. “So lovely,” I had said to Feryal. “Yeah they’re really cute,” she had replied. Thus, as I approached the wooden table that evening, I blinked and then gulped and then held my breath. Finally I readied myself for sternness. Gautam was rocking on his seat tittering cheekily, “Ooh just one more little drink, one more, then we will come, we promise.” He raised his glass (was that Raki? Oh Lord!) and giggled like a naughty school boy. My heart sank. My stomach sank. Everything sank. “We’re starting at 7 am, remember? Drink up! I’m leaving in five minutes.” I hovered over the group hoping my presence would sober them up. “Noo problem Atulya, we can go wiv Baykaaaaal. I already assed him.” To my dismay I saw Taylan, barely upright, clutching the table. He turned two pickled slits of eyes to face me. The vowels and consonants tripped and fell out of his mouth depositing themselves in a slurring heap between my ears. I sincerely hoped Taylan hadn’t ‘assed’ Baykal and swiftly turned on my heel to check. I spied my friend between the orange branches puffing on a roll up. He grinned at me and saluted. Rules. Order. Are there any to be found in this world of chaos and mayhem? The rocky shards of the Olympos gorge glowed. Night was knitting the cosmos into a glittering tapestry. Only it was threadbare. The moon had punched starless holes into the sky leaving the constellations to fall apart. I yawned and rubbed my eyes feeling the weight of being team organiser bearing down upon me. Because inevitably someone has to play Atlas, don't they? How could I pull this inebriated straggle together? It was then I spied our eleventh earthbagger; a young Turkish woman with boots, backpack and a soupcon of ‘attichude’. This was Canan. To my horror she was also clutching a beer bottle. My earthbag mob had got to her first, while I was elsewhere. Canan squashed herself onto the wooden bench and eyed me coolly. She was a curly haired outdoor Amazon. “I can put my tent up anywhere. I don’t need help. I camp alone all the time,” she shrugged, and tilted the bottle to her lips. The rest of my earthbag rabble cheered. Ooh badass! I thought. And reached for my car keys. It was two in the morning and I was lying in my tent listening to one, two... no there were three owls calling plaintively in the pine forest surrounding the site. A feisty moon held her ground in the night sky. Under her gaze my canvas resembled the fluorescent blue light of an old British police car. My thoroughly potted earthbaggers had returned at gone midnight, giggling and carousing their ways into their tents. I knew because I had heard them too. Sleep avoided me. A small hump under my right hip had in the course of the evening mysteriously turned into the K2. It now pushed painfully into my backside. My mind, evil trickster that it is, spied this window of sleepless opportunity. It turned into a mad-thought production line. I was beset by every available concern possible. How can I wake the baggers? They’ll never get up. And I’m responsible. I have to make this house happen. Tomorrow is stem wall day. Gravel-filled bags. But is the weave of the new bags strong enough? Should I add limecrete to stabilise the gravel? We need ash for limecrete. OK I’ll get Baykal to make a fire. Will it rain tomorrow? The app predicted rain. May be it’s wrong. I hope it’s wrong. It was then I heard a light patter on the tent. The app hadn’t been wrong. Rain was here. And my tent wasn’t waterproof. This was obvious, because it was already dripping ever so slightly to the right of my bed. It was 7:30 am. The air was a mushy grey porridge. The advantage of having your group camp on site, is of course there’s nowhere for anyone to run. The team were assembled, albeit staggering and yawning, by our trench. Taylan clung desperately to his Nescafe and cola concoction. Gautam shuffled guiltily into our freshly dug trench, the circles beneath his eyes now veritable bruises. Canan, however, strode up to the site, eyes gleaming, hair flying, looking like Turkey’s answer to Boadicea. And yes, I sighed a little with relief. 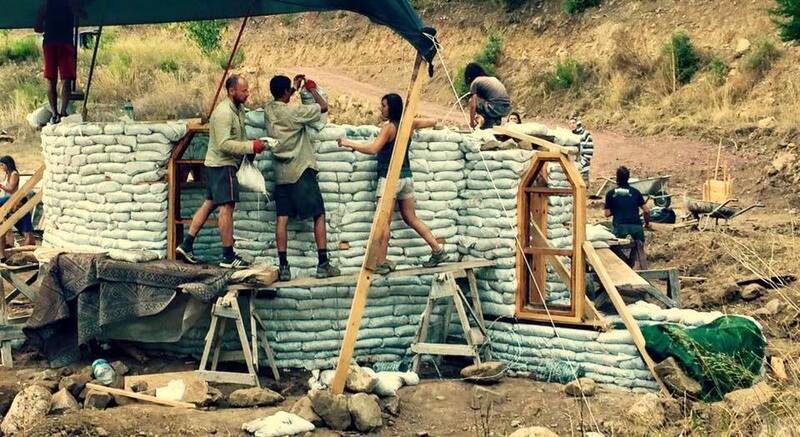 Many assume it must be a dream to be the host of an earthbag building workshop. 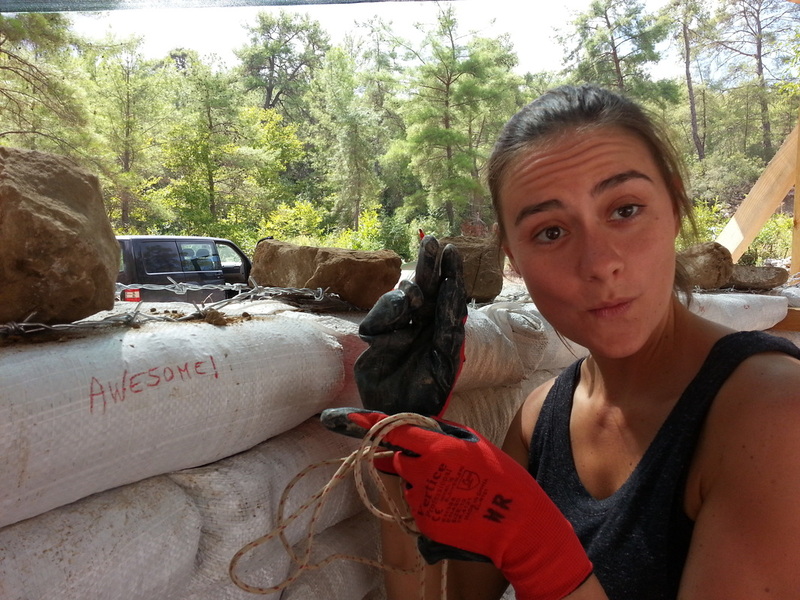 You learn how to earthbag and get a house for free, right? Let it be known, the hosting of a workshop is demanding. You have to organise the materials, prepare the site, keep the guests happy, not to mention 11 strangers defecating in your toilet. And then there are the spontaneous plan changes of the batty workshop leader. Baykal stood unmoving, a pillar of calm in a lawless world. “It’s just rained. There’s no dry wood,” he said. I sighed. The ash in limecrete is crucial. It provokes a chemical reaction that hardens the crete. 11 earthbaggers trained their eyes on me waiting for my verdict. Baykal scratched his head. “Give me an hour,” he mumbled suddenly. Pulling his mobile out of his leather belt, he began dialing numbers. He walked away from the circle and crooked his head toward the phone. If I’ve one image of Baykal during that workshop, it’s of him muttering into a phone and making impossible things happen. The phone is Baykal’s magic wand. Numbers are tapped. Words are uttered. And whatever you want mysteriously arrives. An hour later a VW camper van rolled down the slope and onto the site. Four large bins of ash were hauled out. Lord knows where Baykal found four bins of ash at 8 o’clock on a Tuesday morning. But he did. We were back in business. Limecrete business. And this in all truth is when things really began to snag and tatter. Perhaps it was because rather than earth, we were working with gravel and lime. You see, it’s the mud that holds the magic. 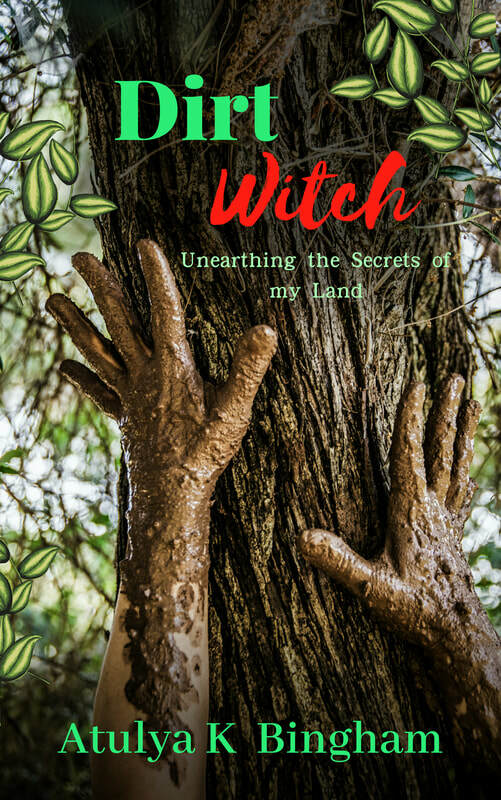 It’s Gaia’s dirt that bonds and empowers. Isn't it? A brave sun gilded the clouds for a while. I watched Kim shoveling with a spade that was longer than she was tall. Canan, an all-rounder, stirred the 'crete and laid the bags. Despite the previous night’s alcohol binge, the team lacked nothing in dedication. The circle was a gladiator’s arena of frenzy. Wheelbarrows full of limecrete and gravel rumbled over the ground like chariots. Polypropylene bags flew like flags. Everyone was striving for the roof. But by afternoon we were still wrestling with the first layer of the stem wall. “We’re behind schedule,” I said to Baykal, the incumbency steadily crushing me. He scratched his chin. “No problem. You just tell me when you need back up,” he grinned. That night no one drank. They were too tired. Besides it was raining. Hard. No one slacking in the face of the stem wall. Left to right: Emma, Canan, me, Gürkan, Kim. Ah, we humans are like spools of thread. Some wool, some silk, some polyester. Yet until we unravel, the real us is never seen. Our truth is there, always there, twisting and turning within. It is coiled up. Hidden. Often even from ourselves. This is a tragedy. Because our essence is perfect. It is exactly what is needed at any given time. It is the part of us that is miraculous. It was on day three we all unraveled. One by one. I pulled back my tent flap on the morning of the third day to an unpredictable sky. One minute it was a morbid grey shroud, the next a cobalt, sun-emblazoned sheet. The wind whipped the tents. They were canvas contortionists bowing and buckling with each gust. I couldn’t decide if it was a dance or a battle they were engaged in. The night hadn’t been kind. A brisk deluge at 10 pm had flooded one tent. Its occupant had taken over Kemal’s hammock on the balcony, she was now huddled there hat pulled over her hair, blanket up to her chin. Kemal and Gürkan, the two tent-forgetting late comers from day one, had thankfully possessed the foresight sleep at the guest house. As I moved toward the house balcony for a coffee, I surveyed the garden. All I could see were skirmishes involving pieces of plastic and earthbaggers who were attempting to keep their tents dry. Finally, the team assembled in front of the house. Bedraggled. Exhausted. “If it wouldn’t be too inconvenient, I wonder if we could move to the guest house too.” Gautam now looked as though he’d been punched in the face multiple times by the bad weather demon. “We just can’t sleep in the tent. We tried,” said Kim, still beautiful and petite on one hour’s sleep in a week. “Sure, I’ll take you at lunch time. Oh God, I hope the rain backs off for today.” I stared across the garden at the ring of limecrete-filled sacks below. The only good news was, the temperature had dipped significantly. “There’s no water in the taps.” It was Emma who spoke. She strode over in her Dr Martin boots clutching a cup of herbal tea. Feryal poked her head out of the door, “Yeah, the water’s been cut off. They’ll turn it on soon.” Then she returned to the kitchen, with her covey of food angels, to rustle up breakfast for 15 people. I shook my head and laughed, albeit weakly. Because reality was beyond my control, and it had decided to unwind messily. Afternoon came and went in this fractious vein, with Murphy writing all the laws. My shoulders were stiff and aching from carrying the planet around for so long. By the end of day three, one tent was flooded, one tent had blown away, we had four people now sleeping at the guest house, the water was still off, everyone was beyond exhausted, and we were so far off schedule nothing but divine intervention could save us. I swore I would never EVER do this again. A house in a week. What had I been thinking? Madness. And now I would pay. Battling on. Left to Right; Kim, Guatam, Domi and Gürkan. ​A lesser group would have collapsed on day three. They would have grumbled and whined, and separated into ineffectual back-biting factions, perhaps even run to the beach never to come back. Really. We arrived at the guest house for dinner. Night was cool. Standoffish. I moved to a table to eat in my own self-persecuting company. The team was a little fragmented as some showered and others ate. I noticed a small ogre of bad feeling making a bid for the group energy. He was a mottled, warted slime of a character loitering just over the brows of conversations, waiting for a chance to sneak in. And it wasn’t mud magic. It was a different kind of spell. The kind we cast the moment we elect to tap into the best in ourselves rather than the worst. The moment we, yes we (not the mud, nor the sky, nor divine intervention) choose our emotional state, and decide to make the optimum happen. A beer appeared in front of me. Cold, dripping with condensation. I looked up to see Gautam smiling at me. “This one is on me,” he said with such kindness and compassion I nearly cried. The gesture was so poignant. So perfect. Blinking back the tears, I grinned and took a swig. The team collected in one of the wooden platforms in the garden. The table began to spawn brown bottles. Grabbing my own beer, I kicked off my shoes and climbed the steps to join them. My earthbag family cheered. There were pats on the back. The clunking of bottles. Followed by the discussion of the limitations which each of us had had to face; some physical, some emotional, some psychological, some energetic. Because there always is a limit. A point at which we snap. And through those limits we understand ourselves, and our place in the whole. Taylan roared with laughter. Kim sipped quietly from her glass. Gautam giggled. Emma stretched her back in a yogic half-twist. Canan blew a puff of smoke into the air. Each character was a yarn creating the fabric of our team. And as the beer flowed into the night, the warp and weft of the group tightened. I released the end of each thread and let it find its own way. Planet Earth slid from my shoulders like a fat, blue football. It rolled into the centre of the platform and out into the garden. It kept on rolling, out of the guest house, through the chasm of the valley until it disappeared from sight. Now no one was responsible. There was no one to hold it all together. I wondered what would happen. Gautam: Film maker and off-grid empire planner. Has a penchant for Raki. Canan: Outdoors adventurer and expert nail banger. Doesn't need help with her tent. Kim: Entrepreneur. Bag folding supervisor. Handy with the plaster too. The earthbag team. Many colours and textures. Each perfect. Part Three - A Team without a Head? Mustafa the carpenter making some mighty fine door frames. By seven thirty in the morning, the earthbag crew had assembled on site. Gone were the grim lines of stratus from the previous two days. The sky was a vault. And it had now opened showering us in gold and lapis lazuli. The land was cupped in the hairy green hands of the forest. All about us large mounds of earth protruded like giant dusty knuckles. That dirt all had to be shoveled into bags and laid on our wall. “I wonder, do you think there is any chance of us reaching the roof?” It was Gautam who asked. He was standing in the centre of our earthbag ring, head was cocked to one side, jet hair to falling onto his shoulder. It was clear from his intonation, he didn’t have too much faith. I glanced at the paltry three layers of bags we had laid. We probably had thirty more to go. Not to mention the windows, the shelving, and the dreaded arches. We were almost half way through the course. Let’s face it. Reaching the roof looked impossible. Impossible. Such a decisive word. So sure of itself in its despondency. And with so little claim to certainty. For I have witnessed far too many impossibilities become realities. We all stared mournfully at our measly three layers of wall. The only thing we had going for us was that the door frames had been installed – wonderfully, precisely – by the carpenter. They were invincible frames. Perfectly straight and as thick as girders, with zero propensity for buckling. “Six layers?” Taylan’s right eyebrow rose a good eight millimetres. He took a large swig of his Nescafe-cola mix, and stared yet again at the metres of thin air above our earthbags. Emma strode into the circle, cap pulled down, boots kicking the stones. “Six it is,” she said and grinned. Many are those who doubt the physical power of vegans. It was day four and Emma was still striding. Still ready to dig and haul. Domi, our Hungarian strongman, trotted into the circle with one of our wooden bag holders. He opened the legs and placed it on the dirt ready to begin. I held my hand up, palm facing out. The group stood around me, a circle of bleary eyes intermittently focusing on the ground, the lack of wall, and me. It looked like a contradiction. Get to the roof and do what you want? Yet there were murmurs of agreement. Nods and movement. I could sense everyone already had an idea of what they wanted to do. If people are connected to their soul, and they know what they enjoy, what their passion is, it’s easy. Because that passion is derived from their core. And their core is moving in sync with the whole. The wind jived through the pine trees crowding the steep hill above us. They shimmied and rocked as though following an invisible choreographer. The branches whooshed and rattled in time. As I scanned the forest surrounding the site, it moved as one being. A wave of green needles. I turned my gaze back to our earthbag circle. A heavy roll of barbed wire, white sacks, shovels, picks, rocks and earth, all began moving. It was coming to life. It was just before lunch when they arrived. And how we grinned when we saw them. With their tight butts and their gleaming six packs, they looked as though they’d hacked their way straight out of Sparta. This was the Olympos rock climbing squad (a couple of them, at least). Plus a professional female wrestler from Germany. Back up. It was here, and in style. The sky was yellow and burning now. The sun a fire-lobbing missile. One by one, the back-up biceps stormed down the track to our dirt mountain. And it was here they ran straight into Ayşe. Ayşe is an old friend of mine, and protagonist of my novel Ayşe’s Trail. She has walked the Lycian Way (all 500 kilometres of it) about eight times now. The first time she did it carrying a twenty kilogram rucksack. All in all, she is fairly unstoppable and something of a maniac. The moment I had said everyone should do what they wanted, Ayşe had pulled her headscarf over her hair and made for the great hill of dirt. She was standing there now, a five kilogram yogurt pot in one hand, and a polypropylene sack in the other, wiping her brow with the back of her wrist. “I can’t work in a team! Oof! Look, it’s not right how they’re doing it!” Her sharp blue eyes were gouging holes in the back of one of the mountaineers. He must have felt the burn between his shoulder blades, because he whipped around. “Hey Ayşe! Why are you using those small buckets? It takes forever! Let’s time it. See which is quicker.” The young man leaned on his spade as he spoke. Both faces turned in my direction. Both were indignant. “Do the ends need to be flattened?” Asked the mountaineer. He was covered in sweat. His fingers curled around the spade handle, its head buried in a mountain of fresh, brown earth. I shuffled a little, and scratched my chin. Ayşe sniffed and stalked to one end of the dirt pile. The mountaineer shrugged, yanked his spade out and moved to the other. I pulled my phone out of my pocket. The digital clock showed it was lunchtime. The hill of dirt (Mordor) from left to right: Ayşe, Gunes, Derya, Canan, Kemal, Taylan. Not everyone is about muscle and strength and pushing though. We all come hardwired with different gifts. The question is never what someone can’t do. It’s always what they have to offer. I’m no longer certain to what extent I believe in the concept of a team ‘leader’. I’m not sure what such a role entails. Because a team functioning from its essence is headless, leaderless. It simply dances all by itself. To be truly alternative, to genuinely offer another way of existing unlike that which is pushed down our throats by the media, education systems and our cultures, we can’t simply engineer the physical, build new systems, new hierarchies. If we still believe some people, some skills or some attributes are more valuable than others, we are as conformist as the mainstream. Luckily we had someone to illustrate this point. It was Harika. “You know, I juss can’t go at zis pace. Iss too much for me,” Harika had said in her light Belgian accent the previous afternoon. She had been lying on her back in the dirt at the time, wheezing unhappily. Harika possessed a graceful character. I would liken it to a cool breeze on a ragingly hot summer day, softly weaving in and out of us as we worked, singing as she went. 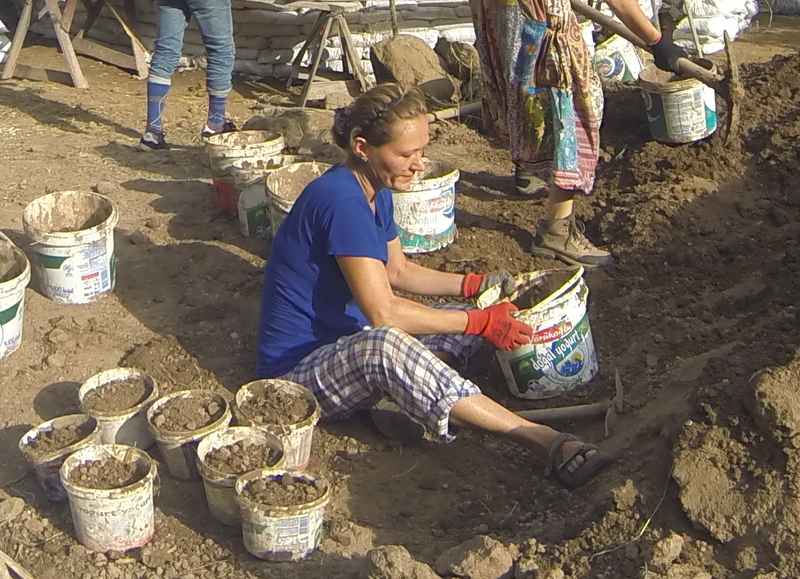 Earlier in the day, I had seen Harika moving to the dirt mountain to begin filling bags. Her legs flowed out of a pair of denim shorts. A floppy hat was pulled over her hair. I followed her out of the the earthbag ring. As I approached her, I crossed all eight fingers. “Harika, I wonder if you can measure the walls.” I knew what we needed more than anything else was a measurer. The walls were flying up now. And when they fly up, they also tend to fly out, or in, or both out and in. The only person measuring was me, and I wasn’t doing it particularly well. In fact I was hopeless. My own mud house is a testament to my failure with regards vertical straightness. She lifted the brim of her canvas hat. “OK, I can try,” she said. We both turned and stepped back into the centre of the earthbag circle. I walked to the array of pots on the ground, bent and pulled the plumb-line out of a bucket of nails. Harika took the line in her hand and moved to the inside of the wall. Holding the string up to a tamped bag, she let the weight fall. “Do you have a pen?” She asked. A pen? I wondered what she could want with it. Ten minutes later, Emma and I were dropping a bag onto the barbed wire, when we noticed some red arrows on the polypropylene below. “Harika, what’s this?” I called out. Our measurer skipped over beaming. Genius. The arrows were unambiguous and easy to follow. Harika had even added “1” and “2” to indicate how many centimetres in or out we should lay the next bag. Over the course of the next two days, I tried in vain to find someone else to measure the walls. No one could do it right. Most threw the line down in disgust after five minutes. Unlike my own mud home where the walls had ended up veering out in preposterous amounts, this time we had nothing but minimal bulges. The shade dripping from the pine trees lengthened. Their boughs turned dark emerald in contrast to the azure above. The definitions between the rocks became more pronounced. They were wrinkled stone hobbits now, their lines giving them both depth and character. It was a striking picture. Perfectly put together. The land was humming with human activity, and I wandered into the earthbag circle looking for a space to fill. Gautam and Domi were uncoiling the barbed wire in one corner. 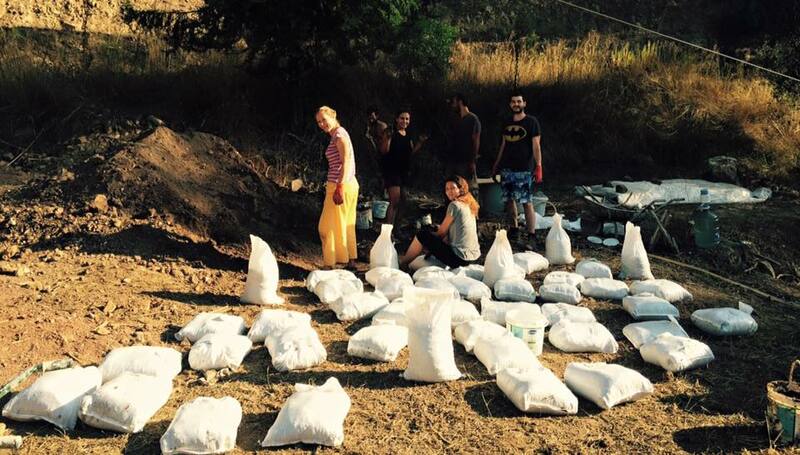 Canan and Baykal, Emma and Feryal were shoving bags down on the wall in another. Harika was measuring. I moved outside. Taylan was nailing the filled bags closed. Kim was folding sacks. Ayşe and the back up muscle had become a veritable dirt bag factory with tens of ready-filled earthbags lining the perimeter of the wall. Marginally disconcerted, I stood there realising I was utterly redundant. “Six and a half! We’ve done it!” I shouted. Yet I could hardly engender a response. Everyone was too engrossed in their task. Eventually, Taylan wandered in. He had changed into a Batman Tshirt. Standing in the centre of the circle, he stuffed a cigarette in his mouth and lit it. His eyes moved round the earthbag layers. One by one. I craned my head back (because Taylan is tall and I’m rather short). Then I stood on tiptoe and patted him on the shoulder. Blowing out a mushroom of smoke, he moved toward the wall. He touched the top layer of earthbags. A frown pushed the fronts of his eyebrows down. Something inside me turned a little cold. “Uh oh. These are not damp. The earth has gone in dry,” he said sticking a finger into one of the bags. I closed my eyes. The earth has to go in the sacks damp so that it cures into a clay brick. If it doesn’t, you are simply left with a bag of dry dirt. Ayse had been right. The bag-fillers were going too fast. A prolonged groan moved up from my stomach and out of my mouth. At least half a row was in this dry, loose state. We’d have to take the bags off and start again. The light turned from gold to silver. The air smelled sweet with evening. And it was then I happened upon an idea. It didn’t crawl into my mind via a dank tunnel from my subconscious, as some ideas do. This one vaulted into my head. If ideas wore clothes, it would have pranced on stage in a sparkling unitard. Quite possibly, grooving to a disco beat. This idea was pivotal. Little did I realise at the time, it was going to change the entire fundamentals of earthbagging as we knew it. Gunes; Dirt back up. Otherwise to be found hanging from cliffs by his index finger. Harika: Future director of "Earthbag, The Musical," and the only person to keep the wall straight. Jeff: Rope access worker by day. Donating his sweat for an earthbag house in his free time. 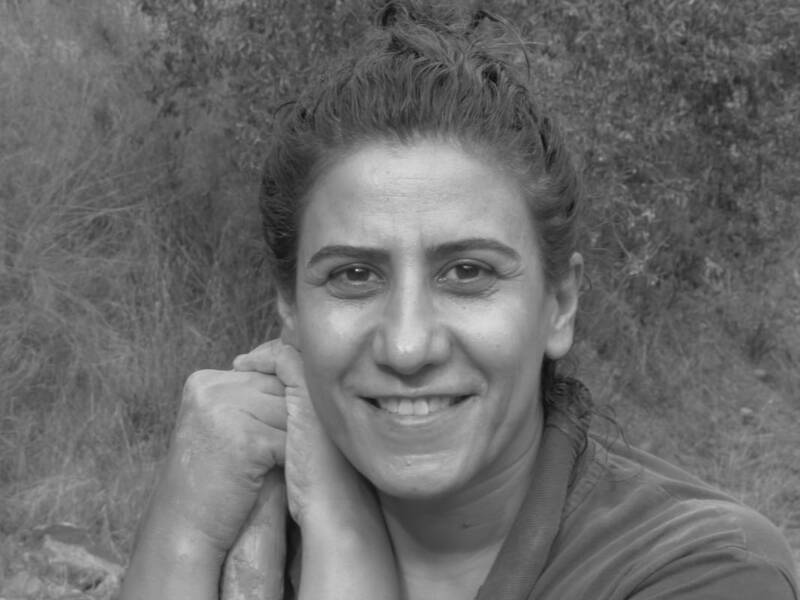 Ayşe: Hiker and protagonist of Ayşe's Trail. Hard to please, but makes the best earthbags in town. Gürkan and Taylan getting on with it. “I need some water. Someone bring the hose.” Evening was upon us. The shadows were dying now, their thin outlines dissolving into the dusk. The buzz of the crickets ebbed, and the forest twittered with feathery life hunting for a roost. I turned to see Gürkan dragging the green snake of a hosepipe over the dirt towards me. Gürkan was the other tent-forgetter who had arrived late the first night with his friend Kemal. The two of them were as physically disparate as you could imagine. Kemal was an ebony Titan, while Gürkan was a bantam weight action man. They were like Batman and Robin without the tights. “Look, the earth inside the bags is dry. See?” I said digging my index finger into the mesh again. The wall came up to my shoulders. Gazing over it I saw Gürkan peering across at me, eyebrows rising quizzically. Behind him ramparts of ochre earth climbed up to the trunks of the forest. He said nothing. Which was typical. He was a doer not a talker. “Hmm.” Gürkan’s hand reached for his goatie. His other hand passed me the hose. In another life in Istanbul, Gürkan had been a very successful techie at Turkey’s largest telecommunications group. Here and now in the earthbag workshop, he was everyone’s right hand man. You will notice him on nearly every video, a silver-haired fellow with a tattoo quietly getting on with things. Because he was always there. Stretching my arm over the wall, I turned the tap. Water gushed onto the bags. It bubbled on the top of the white polypropylene skin before seeping inside. I let the tap spurt for a while, allowing the bags a good drenching. Then I turned off the spigot and threw the plastic cable to the ground. “If the bags aren’t wet enough, we’ll have to pull all these off and rebuild.” I said feeling the freshly hosed bags. Then I stood back a little and exhaled. “I think we’ll only know the truth after we’ve tamped. My silver assistant disappeared from view. All I could see was a grey scalp moving behind our sack wall as he searched for the tamper. 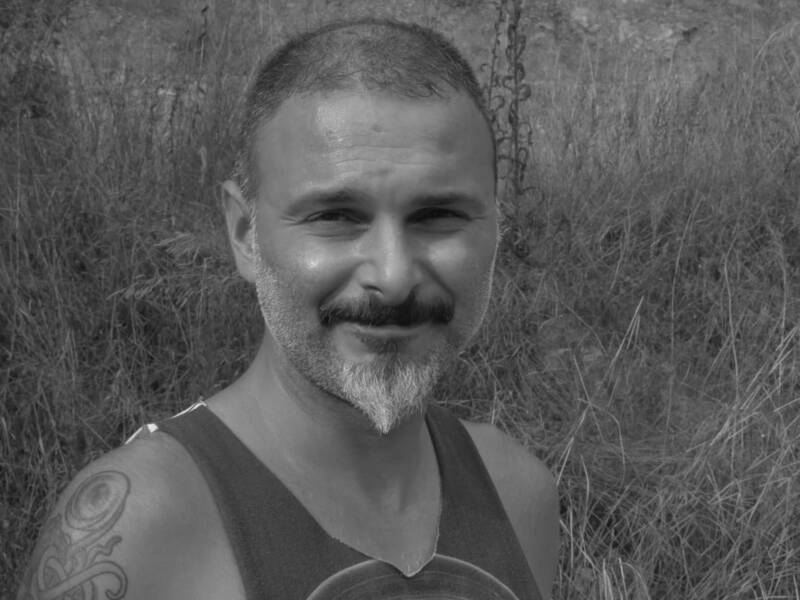 Five minutes later, Gurkan was standing at the far end of a freshly tamped wall, pointy beard split by a smile. He squatted and ran his hand along the top of the bags. “Seems hard,” he said. I moved forwards and tried to dig my fingers in the earthbags. But I couldn’t. The sacks had been transformed into solid bricks of mud. Elation flapped its wings and became airborne within me. I cheered and whooped. Gürkan stood up and remained stock-still on the wall, waiting. “It means we don’t have to wet the dirt before it goes in the bags anymore! Think how much easier it’s going to be to lift dry bags!” And with that I scrambled up the wall to call a meeting. This was the best news I’d seen since the mountaineering team’s biceps. And to think, if that ‘mistake’ of not dampening the earth enough hadn’t been made the previous day, we’d never have known there was another way. Dusk was now so deep, it was brushing the edge of night. Yet within that dimness, the rocks in the dirt came to life. The facets of their knurled bodies glowed in the twilight, until they were no longer obstructive hunks of matter, but shimmering moonstones. But of course, tomorrow was another day. And with each fresh orbit of the planet, there are new adventures, new earthbag hillocks to climb, and invariably new things to go wrong. The sun was a golden umbrella over the site, the pine-covered walls of the valley reaching up towards it. And within this cocoon of earth, trees and sky a house was being born. It was mid-afternoon, and we were racing up the wall at an unbelievable pace. I have, quite honestly, never seen anything like it. More mountaineers had arrived now, drawn by tales from their peers. 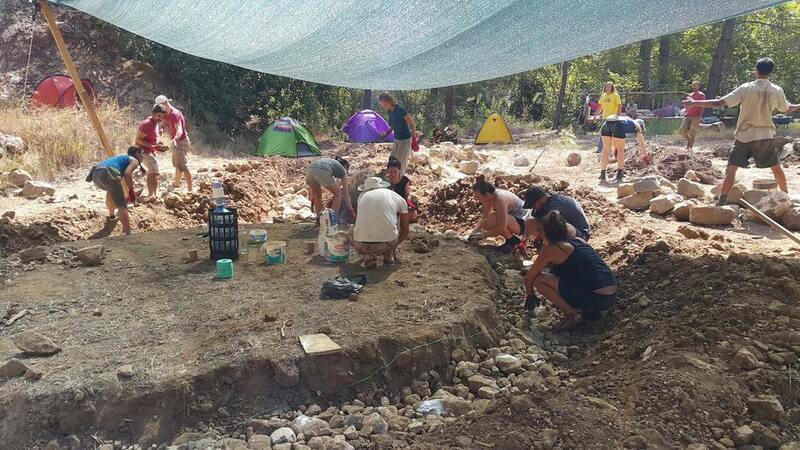 And the dirt mountain, under the tutelage of mountaineer Güneş and hiker Ayşe, was churning out filled earthbags like an open air sausage factory. There was another development, too. Ayşe had now acquired an accomplice, Derya. “I hope you’re filling the bags properly.” Ayşe’s eyes bored like a couple of steel drill bits. “I’m doing it very properly!” Derya knelt in the dirt, hands on hips, thick fleece of brown hair harnessed by a hair band. At almost 50, Derya was our most ‘senior’ participant. 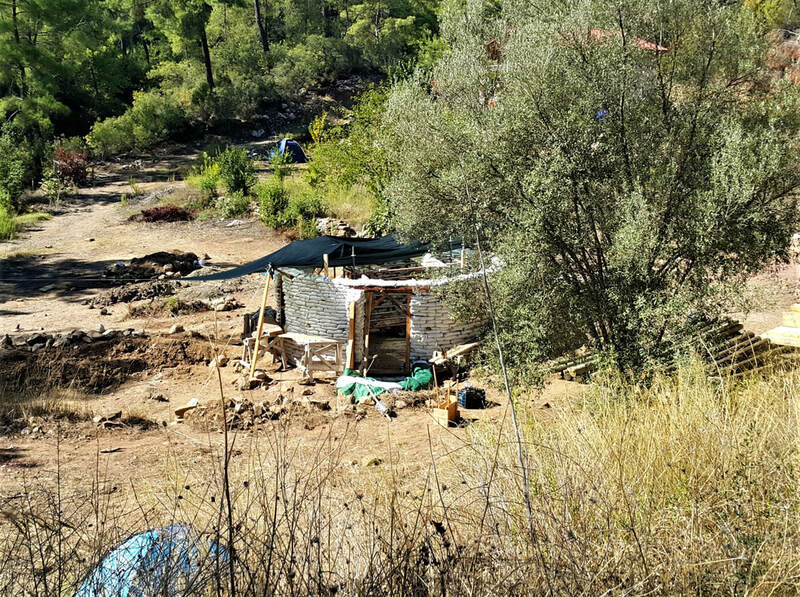 Normally, she was a park developer for Ankara city council, and rather excitingly planned to incorporate earthbag buildings into her next urban project. I had to hand it to Derya, she was a tough cookie. Back on the second day, her tent had suffered a wash out. She’d spent the past two nights sleeping in the hammock, woolly hat pulled over her thick mane. But it hadn’t killed her off. No doubt, years of duelling against the dark forces in municipal politics had made her impervious to pain. Now diehard Derya, out of good will or sheer obstinacy or both, had taken up residence next to Ayşe. I could see them both from my perch on the earthbag wall, butts in the dirt, surrounded by yoghurt pots, scrabbling in the soil like a pair of sharp-tongued moles. As afternoon progressed, the sun skidded toward the peaks. The forests had been carved into sculptures by its golden blades. Our site was now bathed in a renaissance light, turning the earthbag workshop into a chiaroscuro masterpiece. Everywhere I looked, people were either throwing earthbags on the wall, tamping or engaged in a seemingly never-ending paso doble with barbed wire. It was quite something to watch. And then we reached the arched windows. “Erm, everyone gather round.” I stood just outside the door frame, the earthbag wall behind me now reaching my head. Sitting atop the wall were two beautiful organic semi-circular frames. They had been created by our carpenter Mustafa who had hollowed out the inside of a tree, cut it in half and mounted the two halves on lintels. Slowly, reluctantly, the team left their work stations. The sun dipped below the tip of a pine tree, and the light was instantly altered. Suddenly, the earthbag wall was transformed into an insipid backdrop of polypropylene. As the group congregated around me, I cleared my throat. “We are going to make an arch. Well two arches in fact, to go around these frames. Now, I fully admit I’ve never done this before.” As I spoke, I noticed one or two raised eyebrows in the crowd. I shuffled in the dirt. “Why do we need an arch? 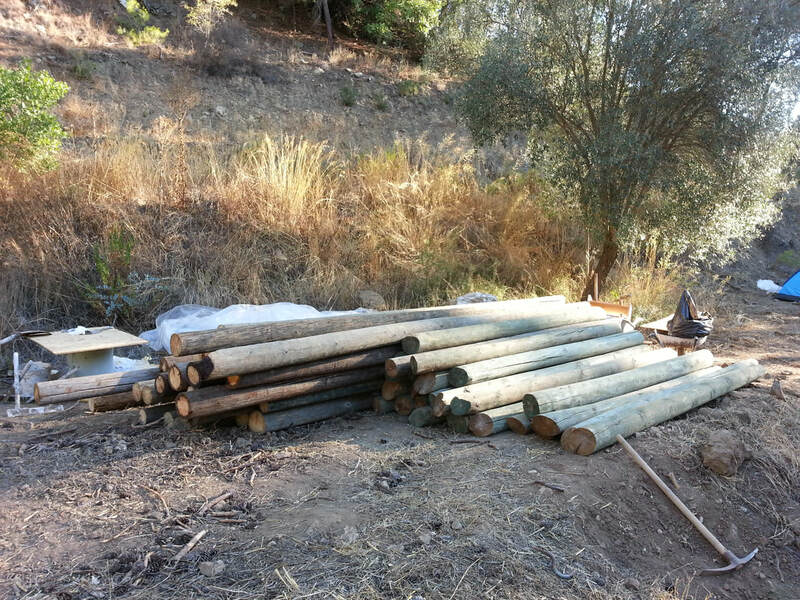 Can’t we just earthbag straight over those wooden semi-circles?” Derya asked. She was still holding an empty earthbag. It rustled slightly when she moved. “Because when we tamp the bags, the wooden frame will crack. It’s too thin.” I knew this from much cracked lintel experience gleaned from my own mud home. Earthbags are very heavy. Tamping them exerts an enormous pressure on whatever is below. 'The arch is architecture’s strongest structure,” I added, which was probably the most I knew about it. “So how do we make an arch?” It was Kemal who asked. He towered over the rest of the group in a white T shirt. “And how are we gonna do that?” Asked Taylan, hands on hips at the back of the crowd, before reaching into his pocket and lighting another cigarette. There were a few murmurs of dissent, and a lot of rumpled foreheads. Everyone was thinking. Which was fortunate, because by the end of the day we’d need every single brain cell we could lay our grime-streaked hands on. ​It was a great idea. I shuffled over with my earthbag and slotted it into the makeshift wooden mold. Thrusting my fists into the bag, I pummelled the earth into the corners. Finally, I lifted the sack from the ‘mold’. It was a definite improvement on the first effort, firmish, but still not firm enough. Ayşe and Emma grappling with wedge shapes. Far from the trials and tribulations of arches, having fun:Gautam, Gürkan, Emma, Kemal, Harika. “I saw ‘ow to make zis. Really. I saw it when I was reading the earthbag book. We need a proper mold you know. In the book, they made a form out of wood.” It was Harika who spoke, her long brown hair pulled back into a pony tail. “Hmph,” I muttered, hoping she was wrong, because making a proper mold was a carpentry job that would eat up time. But our Belgian plumb-line manager wasn’t so easily put off. “Wait. I will find it,” she said. And with that she ran up the dirt track to the main house, humming a tune as she went. By now the sun had sunk well below the mountain. Gone was the golden glow of an hour earlier. The site now appeared drained, as though the colour had seeped through the gaps in the earth. We were running out of time, and a little panic had taken root inside me. I wanted these arches completed by the end of the day. But I knew, if we were unlucky, one small unsolvable issue like this could lose us hours. “Atulya...I think we should take the bag to the arch and try to tamp it on the wall itself. With wood you know and a hammer.” It was Taylan’s voice. I straightened my back to see him towering over my ineffectual work station, trademark cigarette drooping sympathetically from his lips. More of the group were grumbling now. S'not gonna work was becoming a quiet mantra. And if there’s anything that pisses me off, it’s s'not gonna work. If I’ve said it once, I’ve said it a thousand times. 90% of innovation and achievement is belief. Want to scupper a plan? Muttering s'not gonna work is a good place to start. But hey, you know that. Grabbing my failing earthbag wedge, I scrambled back to the wall. Most of the team followed, albeit in straggles. Climbing onto the wall next to one of the wooden window frames, I could feel the anger rising. “Right, if you don’t want to take part in the arch, just go and find something else to do. Me, I want to try it,” I sniffed. Taylan clambered up the wall clutching a hammer and a thin plank. Carefully, I placed our first crumbling wedge onto the wall, its end rammed against the hollow wooden frame. Our animal-loving chain smoker proceeded to whack it into some sort of shape. Once the tamping was complete, we all examined the result. It wasn’t crumbling, and it was definitely wedge-shaped. But there was something wrong. “We need to make the sides straighter. The edge of the bag has to be in line with this.” I pulled the string I’d attached to the centre of the arch. The sides of the wedge weren’t flush with the string at all. “Hmm,” said Gürkan. He was standing below me, barbed wire in hand, absorbing the problem. The air grew a little chillier, the early evening light a little gloomier. From my perch on the wall, I could see a small mutiny occurring. There were grumbles, shouts, wild ideas were being thrown about like frisbies on a beach with no one to catch them. At that point I admit, I was riled enough to throw the bag down and stalk off. Thankfully, the more cunning side of me, the one used to dealing with classrooms of rebellious teenagers, cantered in to the fray. It pushed my hurt ego out of the way, and lunged for the shiny nugget of opportunity discarded on the ground of my pride. Ha! Perfect. It's a shame really, but there is nothing like a bit of tense competition to galvanise a crowd. May be Kemal would build the arch better, and then I’d be saved. Or maybe I would. And I’d still be saved. Either way, two teams were going to be better than one. And besides, I respect the person that rather than simply whining snot gonna work from the stalls, takes the stage, puts his arse on the line and tries to invent a better way. Now, until the moment of the arch, I don’t think it’s unfair to say Kemal was a little less motivated than the rest of the team. He had suffered a bad cold at the outset, and had missed most mornings. But I hadn’t discounted him. Because I had a sneaking suspicion from snatches of conversation I’d had with the man, that he was more of a visionary than a grafter. He was a musician with big ideas. An artist. “OK, I’m going to make this arch,” Kemal boomed and promptly charged over to the other window frame. A fair few of the team rushed to join him. Why? Because he possessed conviction and self-belief, and people are drawn to it like cabbage whites to my broccoli plants. Amazingly, a few of the team remained with me on my arch. Ayşe was there, carefully studying the wedge shape and pondering how to create it. And her presence bolstered me, because if anyone could create a perfect earthbag wedge, it was going to be Ayşe. Gürkan, ever supportive, had moved to the otherside of the arch with the barbed wire, ready to weave it in and out of the wedges. Meanwhile unbeknown to me, a few metres away from the earthbag wall, beyond a ridge on our dirt bagging hill, something interesting was going on. Harika, who had located the earthbag bible, was now hunched over it in a mound of soil with Baykal. I was too engrossed to notice, but Baykal had begun quietly gathering slats of wood, along with some screws and his drill. Dusk was truly upon us now. It had thickened into a cool grey fog. An eeriness settled over the site, as though the earth was breeding the supernatural. But there was something else. The team had been cleaved into three groups: two struggled with the arches, one was grappling with a mold. At first glance they appeared to be spinning separately, muddy asteroids flailing in the void of an unsolved problem. But if you looked closely, we weren’t random pieces of rock, but planets. This earthbag building site was our galaxy, and unexpected as it may have been, this wretched hindrance of an arch was our sun. I said this was the final part. I lied. :) Next episode, arches, guitar solos, and breakfasts to reach the roof for. Gürkan, techie turned dirt-bagger. Brains, stamina and muscle all in one package. Don't start a workshop without him. 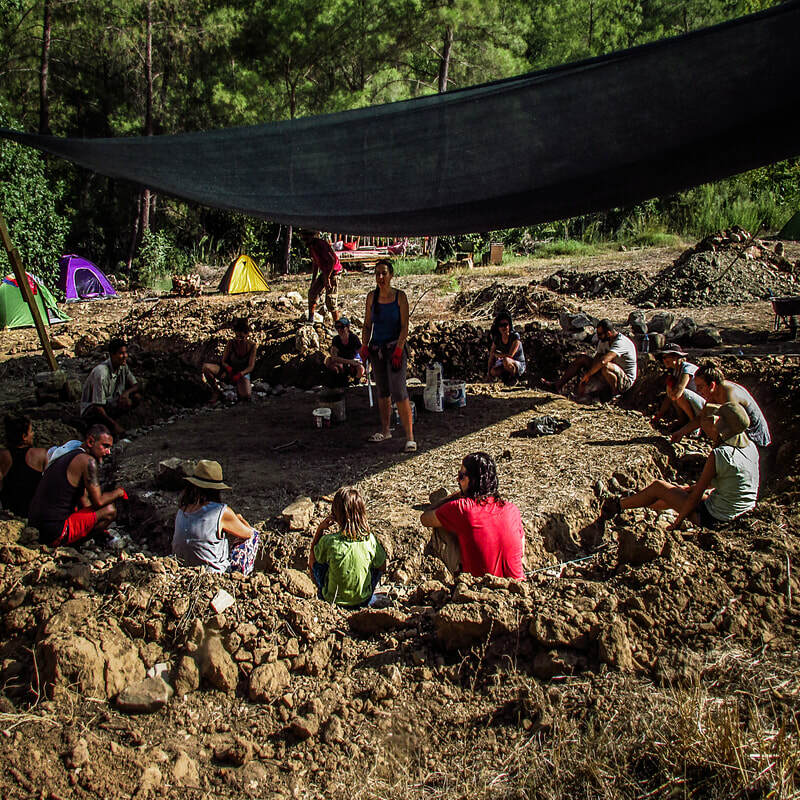 Derya: Fighting for green spaces in Ankara, and fighting with dirt for us. We were almost out of time. Dusk hugged the land. Lines and colours were disappearing into the gloaming, and the North Star had already pierced a white eyelet through the fabric of the sky. Yet despite the hour, the earthbag site was a polypropylene hive, and earthbaggers whirred relentlessly around it. Two teams. Two arches. And plenty of chaos. I was kneeling on the wall beside one of the wooden frames, earthbag wedge in hand, while Gurkan fed barbed wire underneath it. I lifted my head. The whoops were coming from the other arch. Everyone turned. Those on the ground left their stations and collected around Kemal. I quickly slid off the earthbag wall, and trotted round to see...well, what I saw was something that engendered a long exhalation of relief. 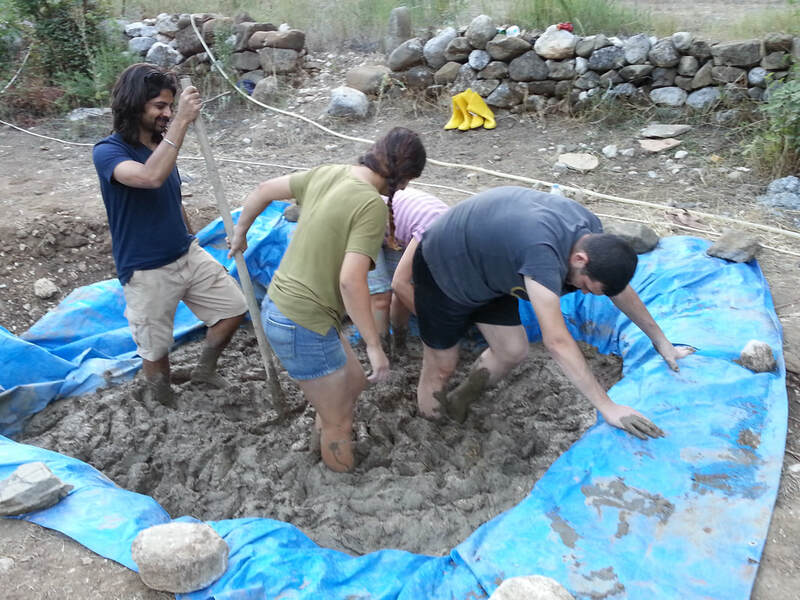 Kemal had formed a rough semi-circle on the ground from pre-filled earthbags that were strewn about waiting to be laid on the wall. The arch was wonky. It was thrown together. But he was sitting on top of it, and it was holding his weight. He was demonstrating the structural strength of an arch in the best way I could imagine. “Brilliant!” I puffed. Kemal grinned from his crouched position. He rocked a little. The arch held firm. And I felt my chest and throat muscles finally relax, because this experiment told me all I needed to know. Even though our organic semi-circular window frames weren’t quite a perfect arch shape, the earthbag arches over them would still be strong enough to prevent them from cracking. Bolstered by Kemal’s arch’s sturdiness, I cantered back to the other side of the house. I was about to climb back up when I saw a woman in colourful salwars holding a tape measure to our earthbag wedges. It was my neighbour, Zeynep. She wasn’t part of the earthbag team at all. She had merely popped over to see how we were doing, (oh and how dangerous that is, because by some trick of earthbag magic you are bound to be sucked in to the construction). Sure enough, despite her best efforts Zeynep had been snared. And that was a stroke of luck, because Zeynep was a dressmaker, and therefore knew about measuring and making patterns. “The wedges are the wrong shape. I’m just measuring around the arch to see how big they need to be, then we’ll make the mold to fit properly.” My neighbour snapped the tape measure shut and strode away, rainbow salwars flapping as she went. The bowl of the land grew cooler, while the forest murmured in the evening breeze. From my perch on the wall, I could just about still see the dirt hill through the thickening darkness. 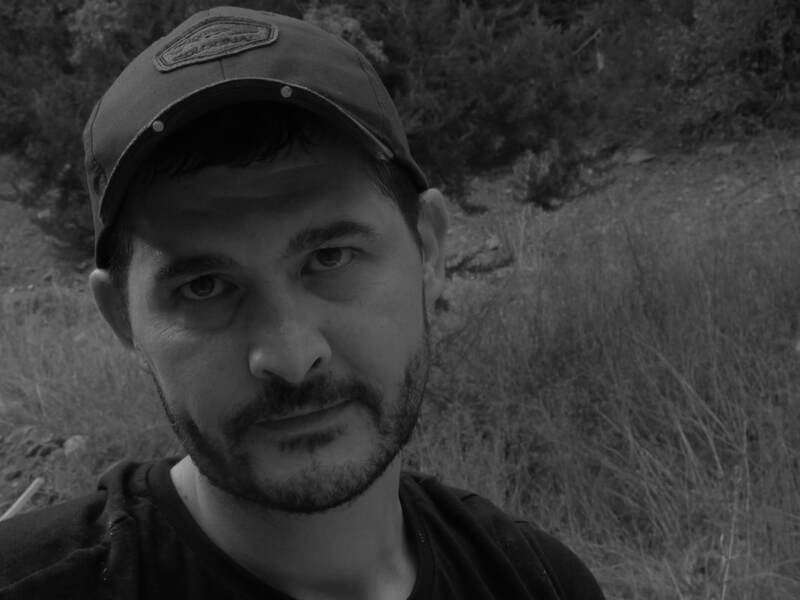 Baykal was crouched on the slope, peering into a wooden box he was making. When Zeynep reached him, the whites of his eyes swung up questioningly. She pulled open the tape measure and showed him. The sky was now a dark smoke, and it fell into our eyes, mouths and hair. Night was growling from his lair in the east, waiting to devour the valley. The stars knitted themselves into constellations. The Earth drew into itself. Time had run out. “Try that,” said Ayşe, lifting her hat slightly. A perfect wedge was deposited in my hand. Patting it, I gaped at its perfect angles. It was like a giant brown piece of Brie. “We filled it up with Baykal’s newly adjusted mold,” she said. I passed the wedge to Gurkan who was crouched on the wall hugging the window frame. He placed it on to the wall. It fit snug. Pulling on the string I’d attached to the centre of the arch, I measured its angle. Gurkan and Ayşe nodded in approval. It was the exactly the right size. Soon Kemal’s arch team drifted over to have a look. As the crowd gathered about this marvel of mud engineering, it was agreed all round: The wedges from the new mold were brilliant. But it was too late for now. Night had fallen flat upon us. There was nothing more we could do. Hurriedly, we all left our stations. Some earthbaggers jumped from the wall, others climbed out of the dirt hill like clay miners. One by one, we gathered our bags and water bottles, and wandered up the hill, a straggle of sweat and dust. The guest house that night was a grotto of warm lights. Trays of food lined up on the counter, each a rectangle of colour; spinach, saksuka, purslane and yoghurt. I sat at a long wooden table surrounded by hungry earthbaggers attacking plates of Turkish mezzes. The night sky slid over us through the leaves of the orange trees, twinkling with secrets as it went. As I stabbed a spear of broccoli, the wonder of team work gradually hit me. It was a slow strike, much like an action replay of a cricket bat hitting a ball. Munching on my greens, I noted how every single member of the team had contributed to the arch. Each person’s energy and idea was a crucial step toward the final outcome. If Emma hadn’t created the initial makeshift mold, we’d never have come up with the idea. The same went for Taylan’s wedge hammering on the wall. Kemal’s rough and ready arch proved that the arch didn’t have to be perfectly round to carry significant weight. He was also the only one with the neck to lead the splinter group, which was so important to test which method was best. Harika had noticed the picture in the Earthbag Bible of the mold for the wedges. My neighbour Zeynep had measured the arch and worked out the correct measurements for each wedge. Baykal had whipped up the wooden frame. Ayşe had filled it and squared it, because she was the queen of perfect bagging. And Gurkan had been quietly assisting everyone everywhere. Once dinner was over, the team collected in a one of the gazebos, the small table groaning under the Raki glasses and beer bottles. I could see Kemal there, his large dark frame part of the group once more. And I was glad. Because I had a job for him. I had a feeling he meant it. The next morning, the sun ripped apart the sky with gusto. It was day six. The penultimate day of the course. And we were bagging for the roof. Everyone was present. For the first time ever, Kemal had arrived early, which made me chuckle an awful lot. He strode straight over to the arches, Gurkan on his heel. “I really would like to see the roof go on. Do you think it’s at all possible?” Gautam pushed a handful of jet black hair out of his face. We were supping a quick cup of coffee just outside the earthbag circle. I lowered my mug. “It all depends on whether we can get the wood here,” I said, glancing at Baykal. He blinked, balanced his coffee cup on a rock, and pulled his magic phone-wand out of his belt. To reach the roof was one thing. To actually lay it would truly be a miracle. “The wood can’t lay about too long or it will warp, that’s why we have to be sure the wall is finished before we bring it in,” I said while Baykal began speaking to the carpenter. “And we’ll finish the wall today?” Gautam shuffled, his sandals pushing away the stones. “It all depends on the arches,” I answered. “Breakfast is ready!” I looked up to see the small figure of Feryal standing on the upper terrace, waving her hands at us. I haven’t said enough about our breakfasts. Nor about those who prepared them. Feryal and her sister Dilan spent every morning chopping, whisking, frying and baking. The quality of the food that sped out of that kitchen was agreed by all to be a feat of culinary expertise. Vegans, paleo dieters, and Hungarians alike were not simply satisfied, but drooling. Many said the house was built on these breakfasts alone. The sun was already taking hot, bright bites out of the land that morning, and we had to squash under the shades of the house for cool. Twelve earthbaggers plus four volunteer mountaineers crowded round the breakfast table. The food could never fit on the small wooden square, so there were dishes all over the balcony floor as well; Home-baked Turkish pastries, salads, muesli, yogurt, eggs, cheeses, olives, confitures, butter, tahini, roasted vegetables and more. “Even my mum doesn’t look after me this well,” said Taylan as he peeled the shell from his third egg. Suddenly an acoustic chord broke through the chatter. Followed by another. I turned to see the bulk of Kemal perched on a beanbag, guitar in hand. He plucked at a couple of strings, black eyes set hard in concentration. Then he strummed once. Twice. Before launching into song with a passion burning hard enough to set the muesli on fire. Nickelback is an intrepid choice for a rock cover at the best of times, but before 9 am at a breakfast table you’re definitely taking your chances. Kemal was riding the crest of a mud building wave though. He and the guitar had become one. Anything was possible. Anything could work. Plates hovered mid air. Spoons of honey halted over bread. Fingers remained jammed in the bowl of olives. All eyes turned and nailed themselves onto Kemal who was working himself steadily up into a rock-singing frenzy. The strumming intensified. He was playing so hard and so loud, I kept checking the strings for sparks. Everyone fell silent and gaped at this impromptu flirt with Glastonbury. Even the sun backed off a little. “Are we having fun yet? Kemal ran his hand down the fretboard for the last time. And it was over. He exhaled, as though relieved of some immense force. Then he propped the guitar against the balcony wall, raised himself from his bean bag, and grabbed a pastry. Once he sat down again, one of the mountaineers patted him on the back. “So the arch went well did it Kemal?” I chortled. “The arch rocks!” He replied. Morning came and went. The sun punched through the sky with fierce determination as midday drew a fiery ring about us. Kemal and Gurkan completed the second arch, and I won’t hesitate to admit it was far superior to the first one we had made the evening before. There were, as far as I could see, no more obstacles before the roof. By mid afternoon throngs of bodies were buzzing about the construction site. You could hardly see the earthbags for people. Over and above the 11 earthbaggers, I could see Dilan, Feryal, Jeff, Baykal and a busy cluster of mountaineers running around our earthbag circle. Spades stuck out of earth hillocks so they resembled large, dusty hedghogs. Wheel barrows heaving with filled sacks littered the site. Domi was engaged in a death-defying balancing act with the barbed wire on the top of the earthbags. Mountaineers crawled all over the wall. There was hair and sweat everywhere. Everyone wanted to witness the last bag going down. Finally, by late afternoon, it did go down. Boom! There was a cheer. Much elation. And then the carpenter turned up. Mustafa the carpenter was dour little fellow, as skinny and prickly as a metre and a half of barbed wire. But he was an excellent carpenter. Pencil jutting from behind his ear, he wandered around the earthbag site, sniffing, scowling, and generally giving the impression the entire project was cursed. Stepping over the door frame and into the centre of the house, he glared at the top level of bags. “We need another layer,” he said. My chin fell promptly to my chest. I groaned long and hard, and shook my head. Baykal, who was far more stoic about these things, simply nodded. “Right brother, another layer,” he said. “Dead level,” said Baykal, still nodding. “Forget the spirit levels. They’re a load of rubbish. Won’t work over ten meters. I’m gonna ram four posts up and do it the ol’ fashioned way. Using water and a pipe. Pah! You lot don’t know how lucky you are! We had to make our own nails in my day!” Mustafa’s eyebrows drew even closer together, his black eyes were so fierce, personally I thought he could have just looked at the earthbags and they’d have leveled themselves. While Mustafa collected his tools, and prepared to mark exactly where we had to reach, I pondered on how we could possibly motivate the team into laying another two layers of bags. I could see most people lounging about on a platform near the forest edge. They were prostrate and supping glasses of tea, not in any way looking predisposed to earthbag. The sun started to slide behind the pines. Their shadows stretched. From the forest I could hear the melodious twittering of birds. I saw Mustafa and Baykal trotting into the house with a lot of large scaffolding poles over their shoulders. The earthbaggers and mountaineers alike were finished. And quite frankly, so was I. 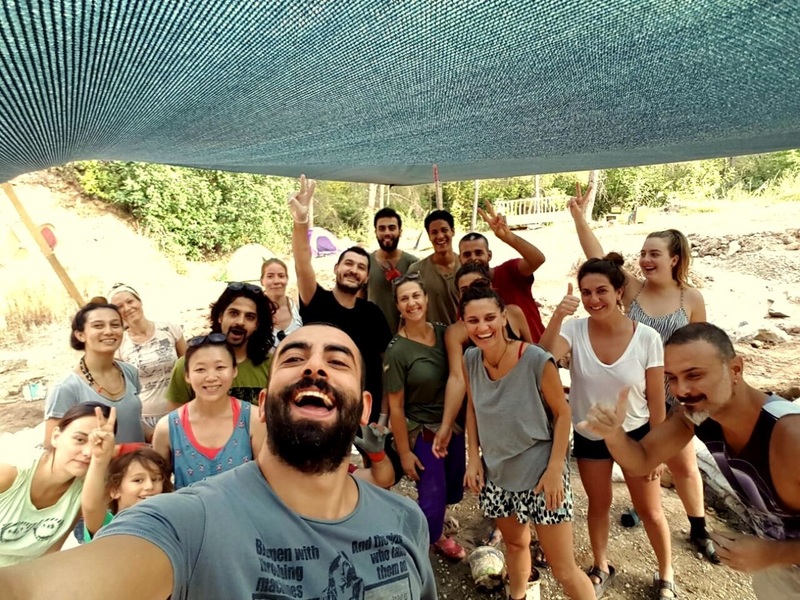 From left to right|:| Harikia, Canan, Derin, Asye, Kim, Gautam, Emma, Kemal, Taylan, Can, Atulya, Jeff, Baykal, Derya (hidden behind), Feryal, Dilan, Lily, Gurkan. VIDEO: How to make an arch. ​Evening pulled at the edges of the sky. The crown of the sun was lost behind the surrounding mountains now, and the air was cooling fast. Mustafa the carpenter had completed his level marking. He packed up his tools and made for his car, grumbling and muttering as he went. In the meantime, slowly, excruciatingly, a few stalwart earthbaggers had managed to complete one more layer of bags. But no one was in the mood. The house was like a monumental dirt bag sink, and the rainbow sum of our energies had drained out of it. The light was dimming now. Most people had vacated the land and were hovering by the house. Walking slowly back to the site I could feel the exhaustion dragging me asunder. One more layer. One more. The carpenter may as well have asked for one more house, because I didn’t have it in me to motivate anyone to even make a single cup of tea. And so I collapsed on a pre-filled earthbag, and gave up. But it was there, hunched in the dirt, that I heard a noise. There was movement somewhere on the ridge of the earthbag wall. I was too tired to see what it was, so I closed my eyes. The fatigue was so heavy it felt as though it was pulling me all the way to the Earth’s core. Suddenly there was a tap on my shoulder. I blinked and looked up to see Baykal. His short beard was chiselled apart with a wide grin. I think it dawned on me then as I looked up at my old friend, how this man was never beaten. He had never once doubted we’d reach the top, even when I had. “Come. Come and look,” he said. It was an almost insurmountable effort, but I dragged myself to my feet and walked to the back of the house. Who should I see there straddling the wall, but Jeff. Ah, Jeff. Not enough has been said of this beautiful soul. Normally, Jeff was a rope access worker in Australia, however this autumn he’d accompanied Feryal’s sister Dilan to Turkey. He was now an earthbagger. A very good earthbagger. He was balm in a fraught, angry world. Unflappable. Unannoyable. Unfazeable. No matter how difficult anyone was at any given time, Jeff would simply neutralise them with his gentle pleasantness. Who could say no to Jeff? Which was why he was the one who motivated the ultimate round of earthbags into existence. “You throw them up to me. Come on guys, we can do this,” Jeff called down to the ground while waving a hammer in his hand. Jeff. Balm in a fraught world. ​At ground level stood Domi and Gurkan. When I saw what they were doing, my bottom jaw dropped a little. Earthbags are heavy, a good 15-20 kilograms apiece. I gaped as Gurkan picked one up from the back of the house, clutched it to his belly like an earthbag baby, and staggered with it to the front. Here he threw it to Domi. Domi must have had an extra helping of muesli that day, because he then hurled the bag like a basketball two metres up the wall. Jeff fielded the bag midair and whacked it straight down on the wall. Boom! The result of this chutzpah was that, unbelievably, the last layer was going down faster than any previous layer in the house. Now, I must admit, this is not the conventional way of laying earthbags on a wall. It fails pretty much every health and safety precaution, and lobbing sacks filled with dirt is a sure way to induce a hernia. What you’re supposed to do is open the bag on the wall and fill it up there, then lay it. But hey, this is Turkey, and anything goes. Baykal stood next to me giggling. Me? I cheered, then grabbed Baykal’s phone and shot a video. The final layer was almost complete. The wood was arriving tomorrow. By Jove! It really did look like the roof might be installed as well. ​I never like the last day of a workshop or retreat. There is the inevitable stench of anti-climax. A sense of loss pervades as everyone decamps the alternative reality they’ve inhabited over the past week. When you enter a workshop, you slide into some sort of group consciousness. Ours was the realisation of an earthbag house. And now that it was over, what would life be without dirt bag building? And then came the bad news concerning the roof. “The wood is not good. I will send it back.” Baykal stood, hands on hips, surveying one of the old telegraph poles Mustafa had procured on the cheap. They had been delivered late last evening. There were a good two dozen of these massive logs piled up behind the earthbag house. “What’s wrong with them?” I asked, pulling my cap down. “They painted them with some chemicals. I don’t want them in the house.” Sighing, Baykal reached for his money belt and plucked out his phone. I gaped aghast, because he’d have to buy in more, and it would cost him. “No worries man,” came Baykal’s ever placid reply before tapping at the screen. I marvelled at his ability to accept and move on. Baykal had always had something of the wise man about him, even when he had been in his twenties. Turning around, I saw the morning sun striking our newly finished earthbag creation. Now, on this final day, it rose from the land like a miniature colosseum. Our earthbag team began to weave their way over in a colourful straggle. Yawning faces bloated by lack of sleep and too much alcohol collected around Baykal and me. “Why can’t we make the roof?” It was Gautam from Mumbai who asked. He shook his black mane and grimaced at the telegraph poles. Little Kim was by his side, sunglasses covering most of her petite face. “The wood has to go back,” I explained. There were murmurs of disappointment from the group. Gautam frowned. He had been desperate to see the roof being attached because he was planning his own earthbag house in India in the winter. The group slowly pulled back, subdued, tired, each of us suffering the final day blues. ​So the upshot was, we didn’t quite complete the house in seven days. Though only by a whisker. Was this a failure? Did this mean all my yabber of believing you can do something was rot? Were the doubters right? Life is an unpredictable ocean filled with waves and troughs, storms and beauty. We are traversing it in the boat of our selves. Belief is the direction in which we are pointing our vessels. Intention is the course we’re plotting. Willpower fills our sails. Certainly the ocean ripples with its own currents. It dances and sways to its own tune. If we don’t open our eyes and navigate, it can soon drag us asunder. Yet when we focus keenly and unswervingly on our direction, when we surf the crests and let go in the troughs, when we hold on to our course tenaciously and can convince our group to do the same, you’d be surprised at what unfolds. Take it from me, without belief and willpower from all involved, that house wouldn’t have risen past the eighth layer of earthbags. The reason I have so little patience for negative thinkers, moaners, whiners, and naysayers, is not because I’m in denial that unpleasant things happen. It’s not because I don’t want the truth. It’s because their boats are all pointing in the wrong direction, namely down. They sap the group energy and eat away at its drive. The truth is, if you want to make amazing things happen you’ve got to hone your mind and attitude, and keep it focussed on where you want to go. No one has managed to build a mud house by starting out expelling a defeated s'not gonna work. No one has realised a dream by losing sight of it and giving up. Ever. Nothing happens simply by magic, and nothing happens without it. You’ve got to stop listening to the voices of doom and gloom, and plug into the power that you are. There is no other way. ​The sun cranked up the temperature. The light of the land turned amber. With the forest insects whirring in ovation, one by one the earthbaggers gathered about the pit of earth plaster we’d created back on day one. How far away that first day seemed now. Kneeling down, I pulled open the tarp. Beneath stewed a stinking, brown beast. It slurped and it burped. It was perfect. Ayşe, seeing a new challenge involving plenty of hard slog in mud, moved closer. The forewoman of the dirtbag-filling rolled up her trousers, tied her fair hair back in a headscarf and gracefully slid into the mud pit. There were oohs and ahhs as the brown gunk gobbled her up. I surveyed my motley crew of survivors; Domi had by now turned crimson, Harika was humming a confident tune, Feryal and Baykal were still speaking (very nicely) to each other and to me, Emma the vegan was wailing that she didn’t want to leave while awaiting her taxi, Canan the Amazon was just arriving in the van of a mountaineer, and she waved at us brassily from the passenger seat. “We couldn’t have done it without anyone. The mountaineers hung out because the atmosphere was fantastic. And it was you lot that created that.” I reached up and squeezed Taylan’s arm. He grinned, pulled his cap down and knelt before the plaster pit. As I wandered off to find a wheelbarrow, I wondered what we’d would all take away from this week. I wondered where we’d be a year from now. Feryal and Baykal: Still run their clothes business but now also own a guest house in the Olympos valley. It’s called The Base. The plaster is finished on their earthbag house, but the interior still awaits. 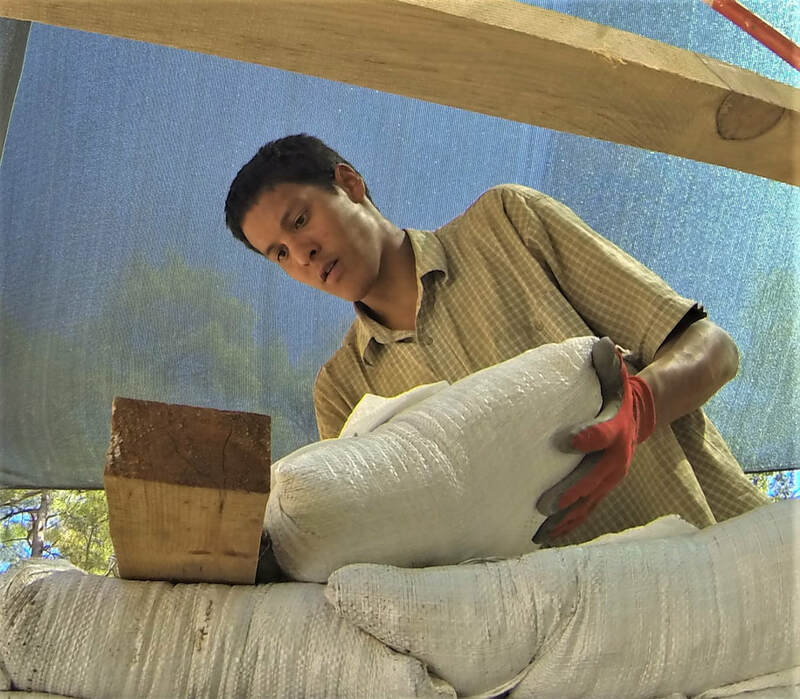 Gautam and Kim: These two built their own earthbag house somewhere near Mumbai, and both Taylan and Gurkan flew out to India to help them. Now Gurkan is planning his second house, this time with a living roof. Domi: Is now the father of a one year old little boy. Taylan: Quit his job in the bank in Ankara, bought a piece of land, and is currently living the dream as a barista while trying to save a bit of money. He’s looking to work with a carpenter for a bit, which is a very good idea if you’re considering making an off-grid empire. Emma: Bought a van, drove round the Iberian peninsula and is now searching for land in Spain for a permie empire and community. Gurkan: Went to India to help Gautam Singh, and tried his hand at a beach restaurant last summer. Now he is in Antakya having a rest, waiting for a new oppurtunity to help someone. Harika: Has been drawing plans of mud homes ever since the workshop. She currently works in Brussels as an education officer, but is trying to escape the big city and finally plant roots somewhere between Belgium, Turkey, Nepal, Colombia. She’s also learning the art of Qi Gong. Jeff and Dilan: Live in Melbourne and where they grow potatoes and herbs in the backyard. 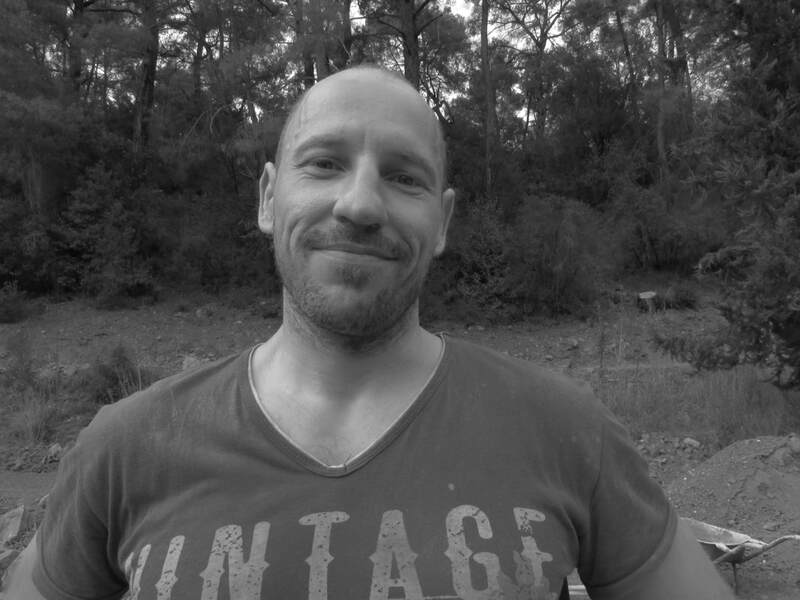 Jeff is doing a bachelor of environmental science and Is working as a landscaper, he often digs up good clay and makes sculptures whilst on the job paying homage to muddier times. 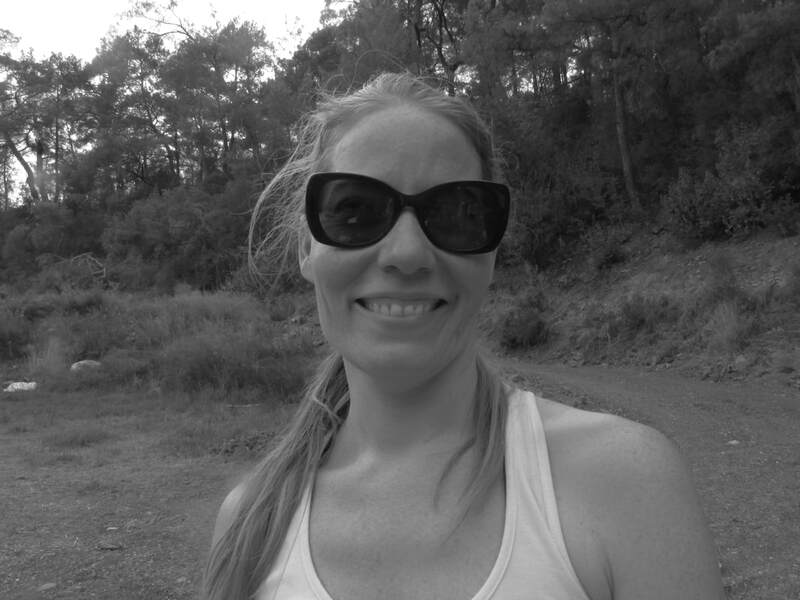 Dilan is a primary school teacher studying a masters of TESOL.